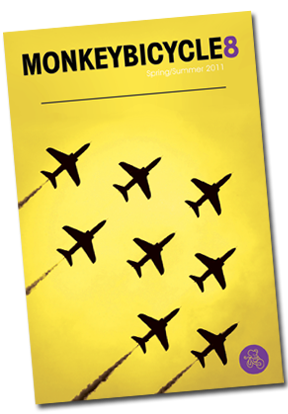 With stories and poems from 22 unique and boundless authors, Monkeybicycle8 is the perfect book for those with an eclectic literarypallete. Featuring cinema stars, cave-dwelling hermits, imaginary monsters, Internet hookups, and so much more, this issue packs a mighty wallop. Contributors: Summer Block, Matt Briggs, Aaron Burch, E. Michael Desilets, Ori Fienberg, Jesús Ángel García, Scott Geiger, Michael Hickins, Steve Himmer, Blake Kimzey, Ben Loory, Annam Manthiram, Laura McCullough, Michael Mlekoday, Dustin Luke Nelson, Ben Nickol, Steve Peacock, Jonathan Redhorse, Vincent Scarpa, Curtis Smith, Rosalynn Stovall, and Andrew Weatherhead.